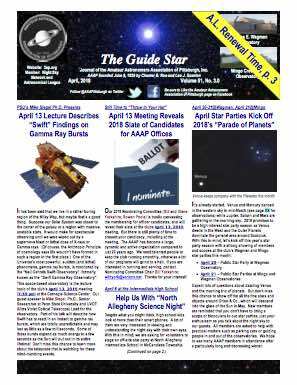 Spring is here and AAAP is gearing up for the 2018 Star Party Season! Our AAAP observatory star parties kick-off in 3 weeks with Wagman on April 20 & 21 and Mingo on April 21. We have external star party events before that. AAAP has two spring 2018 meeting dates remaining on April 13 and May 11, at Carnegie Science Center. Stay tuned and keep an eye on our Facebook Events and www.3ap.org website and calendar. 8:30 – 9:30 PM, Saturday, March 28, 2018 is Earth Hour. As amateur astronomers we are particularly aware of distracting lighting and loss of the night in our Greater Pittsburgh Area over increasingly short periods of years. Night is needed not only to see the stars but also for the biology of humans and other living things. Over-bright lights and unshielded poorly aimed light is not only wasteful energy inefficiency but is also not doing what it is meant to accomplish. Let Earth Hour with its basis in grassroots, remind us of ways to make a difference even at the home – neighborhood by effecting good lighting that recognizes glare, light trespass, shielding, color temperature of LED lighting, etc. and to ask community leaders and officials to do the same. The Amateur Astronomers Association of Pittsburgh often talks about lighting at our outreach events and shares many members with the Pittsburgh Chapter of the International Dark Sky Association. The remaining AAAP spring meetings prior to the annual summer hiatus are scheduled for Friday, April 13, 2018 and Friday, May 11, 2018 at the Carnegie Science Center Science Stage. The speaker presentations are at 7:30 p.m. Weather-permitting look for an announcement on possible rooftop stargazing prior to the speaker presentation. The monthly members business meeting follow the break after the speaker. Our April 13, 2018 speaker is Mike Siegel, PhD the Ultra Violet Optical Telescope Lead on the Swift Telescope, recently renamed the Neil Gehrels Swift Telescope. He will talk to us about the Swift Telescope, what it can see, mainly x-ray or higher energies and how it operates. NASA’s Swift mission is dedicated to studying the gamma-ray burst/black hole connection. In an automatic mode the Swift is able catch gamma ray bursts, as well its three main instruments can be aimed at objects of interest including black holes, comets, bright stars, distant galaxies, etc. May 11, 2018 brings us Mark Kochte, NASA New Horizons Mission Specialist to talk with us about, Pluto and Beyond. He will update us on the New Horizons Mission to Pluto and the upcoming invitation to spend New Year’s Day, January 1, 2019 with the NASA’s New Horizons visit to distant Kuiper Belt Object 2014 Mu69, 44.2 a. u. from the Sun. Please join us at these presentations, which are free and open to the public.